The purpose of judgment my sister is to use judgment as a tool – the tool that is being provided to the self through the mirror. You judge others as unprepared, as unwilling to perform tasking – they are merely mirroring to the self the self’s own behavior. That which irritates, frustrates, angers or causes sorrow for the self is that which lies within unrecognized. It is only on occasion that you take your judgment and try to determine, “Is this within me?” All judgments must be used in this fashion; otherwise, the judgment creates negativity that resides within, accumulating with each judgment, until the self recognizes that which lies within the self is that which is being judged in another. It is to remember my sister, that self-absorption prohibits the self from seeing that which lies outside of the self’s wants, needs and desires; the self cares not if others show up – the self does care what happens to the self when another does not show up. It is to recognize, my sister - that your focus continues to be placed upon the other. 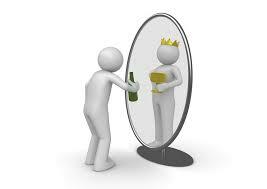 As long as you focus outwardly it is not possible for you to recognize the self. Do you understand? You are indeed self-absorbed, my sister; you are absorbed with making the self correct. Do you understand? It is the self-absorption belonging to the lesson plan of denial that prohibits one from seeing that others are in need of assistance and that the self - while it may be difficult and unpalatable – is the one that is most appropriate to provide this assistance. The cry was placed many, many, many times through the years. The self’s judgment of the other was deep and unrelenting.